As anyone from Seattle can tell you, every neighborhood is unique and everyone has their favorite. Lucky for us, Ballard happens to be one of the coolest areas to call home. Ballard takes a lot of pride in its history while creating a great space for fresh businesses and creatives to thrive as well. What used to be primarily a fishing community has blossomed, rather quickly, into a hub for nightlife and nature. 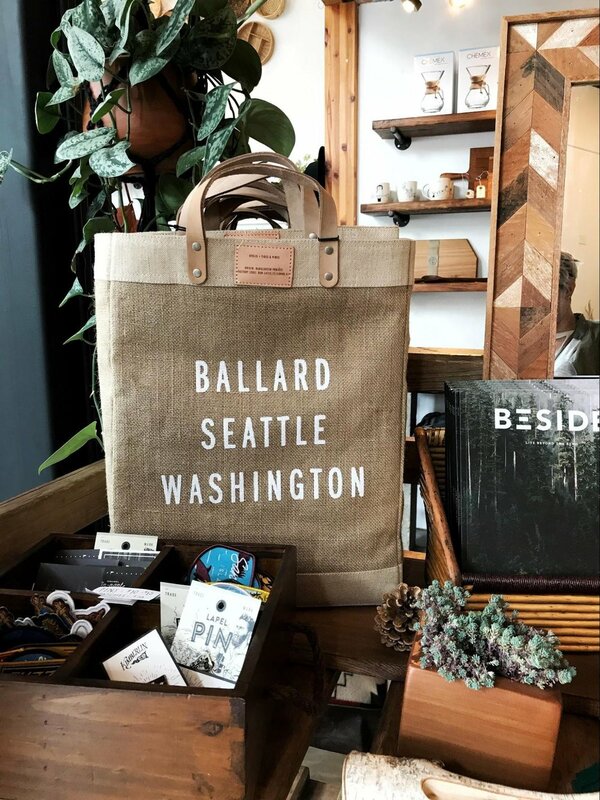 Spend a day in Ballard and you’re likely to spot anything from a sun-bathing harbor seal to people selling custom poetry on their typewriters in the streets. While Ballard is never really “sleepy”, you know it is officially party time when you see the line start forming out the door at Hot Cakes Molten Chocolate Cakery. That’s right people. You heard me. Molten. Chocolate. Cakery. Hot Cakes is our next door neighbors, and they’ve been perfecting their speciality for almost 10 years. This is not a place you want to miss when traveling to our neck of the woods. While we’re on the topic of food, it’s also important to mention Ballard is home to some of the raddest dive bars. A few of my favorites are Hazlewood and Hotel Albotros, complete with taco window. Like most parts of Seattle, there are plenty of coffee shops to lift you out of your mid-afternoon slump. Two of our favorites are Anchored Ship and Caffe Umbria, pictured below. Another draw to Ballard for many people is the great local boutiques. One newer, really special place is Tides and Pines, right across the street! They really embody their namesake, carrying the coolest outdoor-inspired gear for the Seattle adventure seeker. They’re ethically sourced and dog-friendly. Ballard is also a vintage wear and thrifting hub. Boutiques like Trove, Buffalo Exchange, and Lucky are all spots to snag cool fashion finds. Lastly, you can’t bring up Ballard without mentioning the Ballard Locks. This tourist spot is actually a great escape. Connected to a botanical garden, this functioning lock system allows boats as large as 760 ft in length to come in from the Puget sound at a 26 ft. water level difference. As cool as it is to see the locks fill up and chat it up with the boat’s passengers, my favorite part is the fish ladder. You can go underneath the locks and actually see the fish swimming up the ladder, similar to an aquarium. This is a great sight for little ones or anyone looking for a calm, laid-back place to relax. Although Ballard is home for us, so much of Seattle is worth taking a trip to. See you soon babes!